The 2016 ¼ oz Canadian Gold Maple Leaf is the newest release of Canada’s most popular coin series. Having been in circulation for more than 30 years, the Canadian Gold Maple Leaf is not only Canada’s most popular coin, but also one of the world’s most sought after gold coins. Marked by the large, iconic maple leaf, this coin is symbolic of Canada and one of the nation’s original and most important resources. 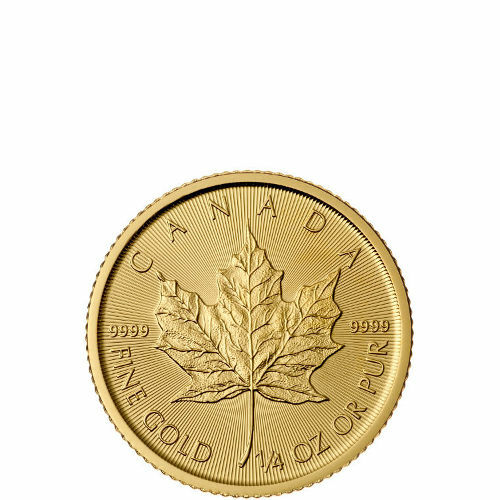 The maple tree and its leaves have been at the center of Canadian culture for hundreds of years, so it is only right that it is the centerpiece of their national gold coin. Individual coins ship in plastic flips, lots of 20 ship in sealed mint sheets. Contains 1/4 troy oz of .9999 pure gold. Face value of $10 CAD. 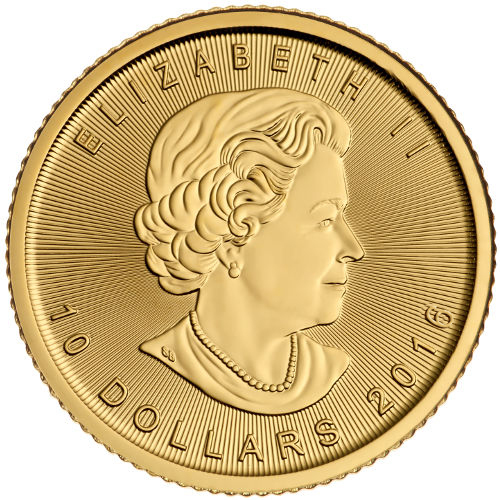 On the obverse side of the ¼ oz Gold Maple Leaf, you will find the neat and elegant image of Queen Elizabeth II. Facing towards the right, the Queen’s image is simple, yet incredibly intricate in its detail. Not only can you easily make out the detail of the Queen’s facial features, the image itself is raised from the face of the coin so that you can feel the contours of her cheekbones and the beads of her necklace. For a coin so small, it’s amazing how much detail is involved in the imagery. On the reverse side you will find the maple leaf dominating the central part of the coin. The national symbol of Canada is perfectly centered and complete with extreme attention to detail. Not only are the leaf’s edge crisp and distinguishable from the rest of the coin, its veins and stems are clearly visible — giving the leaf a much more realistic feel. As is the case on the obverse, the reverse side also sees its central image raised from the face of the coin so that the leaf’s texture can be felt. 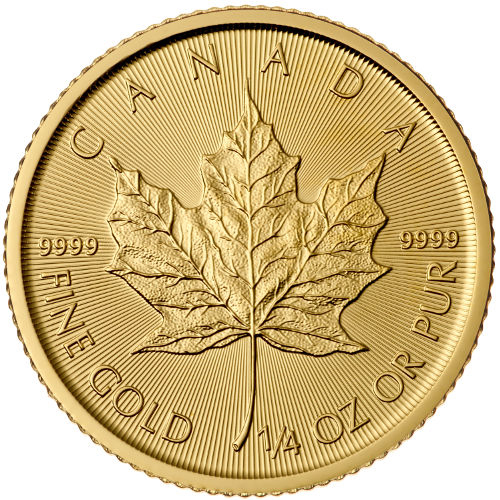 The ¼ oz Gold Maple Leaf is comprised of 99.99% pure gold, meaning that it carries a level of purity higher than that of most other gold coins. This simple fact, coupled with the coin’s extreme beauty is why Gold Maple Leafs are desired by collectors and investors alike. If you would like to learn more about our offering of Gold Maple Leafs, feel free to reach out to our helpful customer service team toll-free at 888-989-7223. Live chat and email methods of contact also exist for your convenience. If you are looking for similar products, be sure to check out our full selection of Gold Maple Leaf Coins.